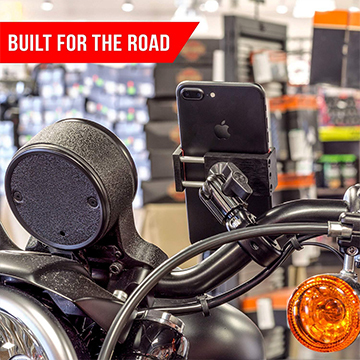 Grab the BEST phone mount on the market TODAY! 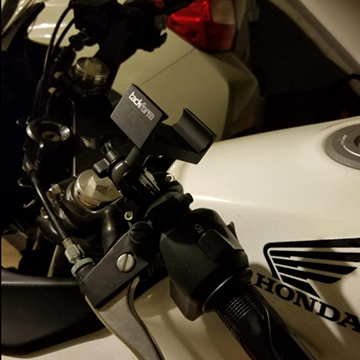 Sick of trying to find a reliable phone mount? 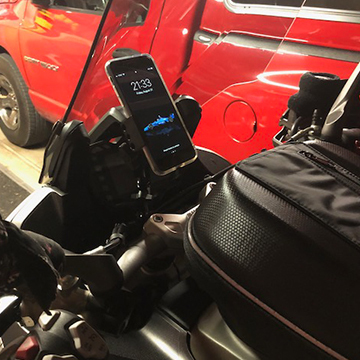 Truth is, plastic breaks and riders are losing their phones to garbage mounts every single day. You're putting yourself, your phone and the people around you at risk. #1 We outperform ALL of the competition. SAFETY FIRST - ALL METAL CONSTRUCTION. 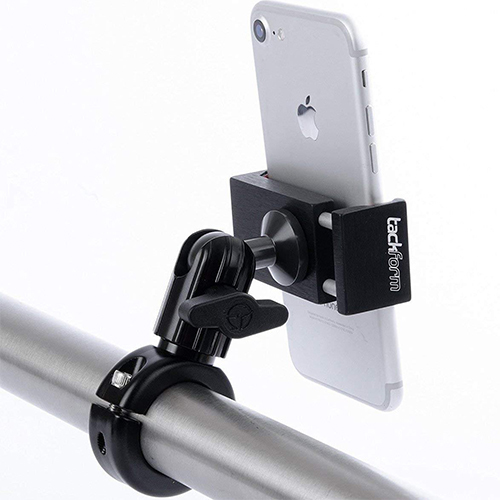 The first all-metal mounting solution, over-engineered to ensure it will never fail on you. Keep your eyes on what matters most. The road. EASE OF USE - SECURE SINGLE HAND OPERATION. The innovative cradle allows you to easily place the phone in and out with a single hand. Even with your riding gloves. 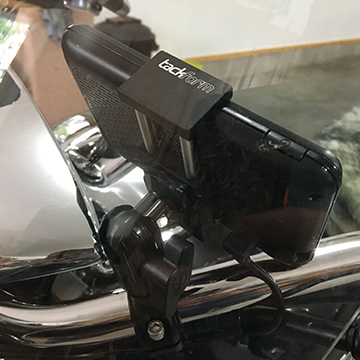 INDUSTRIAL SPRING LOADED CRADLE - Industrial Steel spring loaded cradle ensures your phone will stay held securely even over the roughest of roads. ALL WEATHER & ALL TERRAIN TESTED - All - Weather construction can handle whatever nature throws at you. Snow, Dirt, Rain, & Winds over 150MPH. DURABILITY TESTED - Tested on the roughest terrain, whipping turns, and off-road. Finding a mount where you can get the phone in and out with one hand WITH GLOVES!! 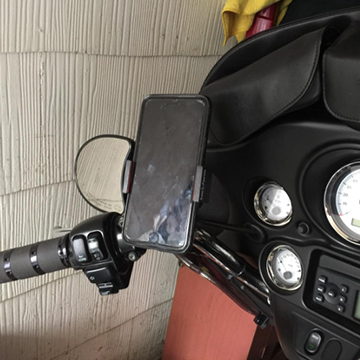 Finding a single handed operational mount that you can trust to hold your phone regardless of what the roads can throw at you. Look no further, our Tackform mount has got you covered. Get the phone in and out of the cradle with one hand. Even with your riding gloves. 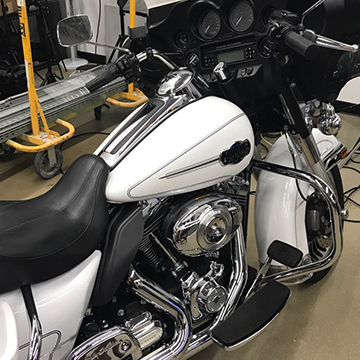 Built for the road with the highest quality materials and premium engineering. Finally, a reliable mount you can count on. 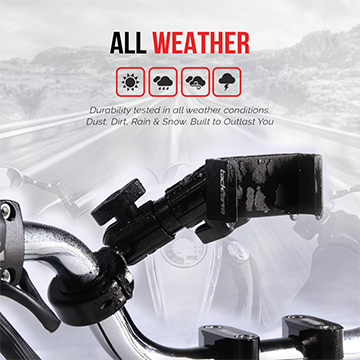 Durability tested against vibration, wind, rain, beating sunlight and snow. Excellent, Excellent product! Rode various terrain such as desert whoops and single track. Phone remained in place well. I have an iPhone 8+ in a standard case. I did try it with my life proof NUUD case and it maxed the clamp size of the phone mount. In my standard lightweight case it holds great. Highly recommend this product! Easy install, and easy to add or remove your phone. Love it! 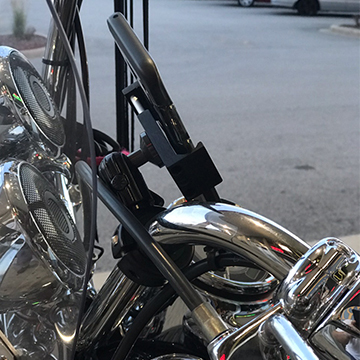 BARS BARS AND MORE BARS - Works with Trackers, Clip Ons, Moto, Zero Drag, Low Drag, High Drag, Maynard, Zed, Frisco, Mustache, Keystone, Clubman, H-Bar, Window, Champs, Breezers, Ape Hangers. Custom 7/8", 1", 1.15" bushings included. Clamp mounts directly to 1.25" Bars without a bushing. 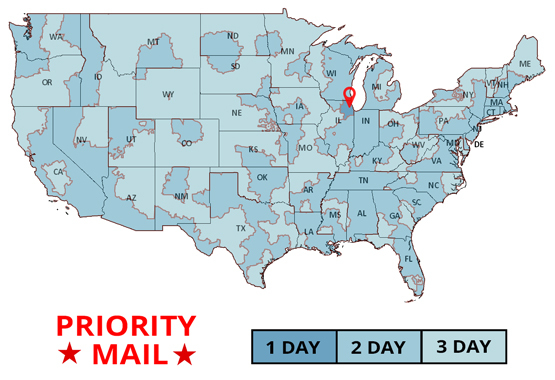 Tackform, headquartered in Chicago, IL, believes that quality products should last a lifetime. In a world filled with low cost, short lived, quick fix mounting solutions, we chose to stand apart by manufacturing and selecting products designed to endure the roughest of conditions. This product is backed by TACKFORM’S 100% BULLETPROOF SATISFACTION GUARANTEE. 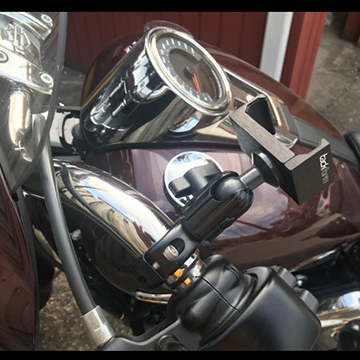 Motorcycle Phone Mount COMPATIBILITY Works seamlessly with all cell phones and devices up to 3.25 inches wide. This includes all standard and Plus sized iPhones with or without a protective case. 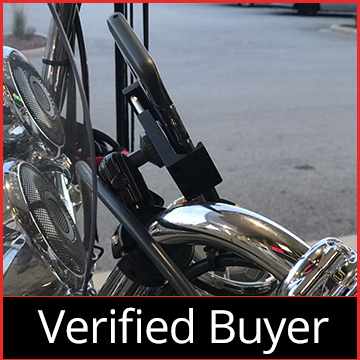 Samsung Galaxy, LG, HTC, you name this motorcycle phone mount will hold it.. Securely. 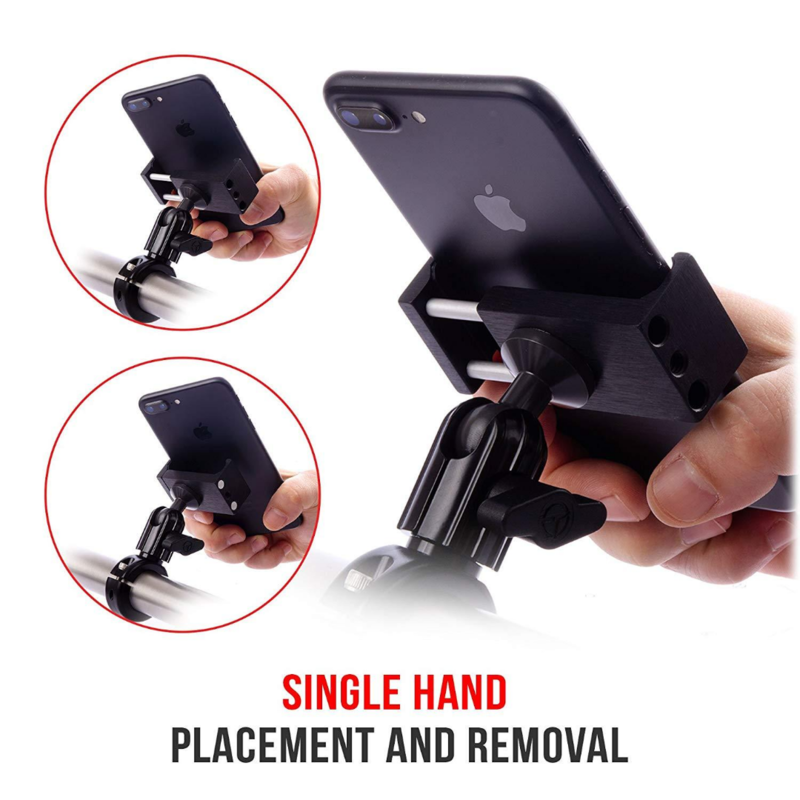 The beauty of this mount is you're able to get any phone, with any phone case, in and out of the cradle with a single hand. 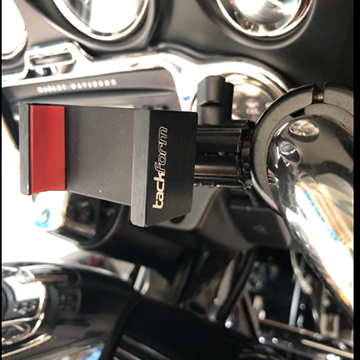 Loaded with dual industrial spring creating a rock steady hold on your cell phone while allowing to easily get the phone in and out of the cradle with a single hand. Add to Cart Now - You won't regret it. This mount is exceptionally sturdy. The articulation allows you to maneuver it into pretty much any position. 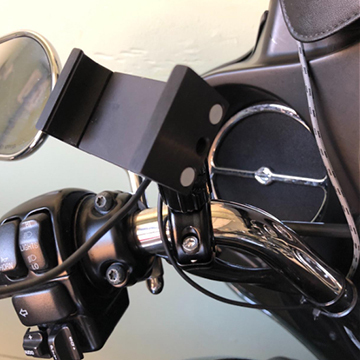 Having become a Waze junkie, I wanted something that I could position properly to get a clear line of sight to the instruments as well as withstand the jolts of my dual-purp. I have my S7 in a Ballistic case and while a rubber web strap is provided, the clamping springs are all that are needed. More money than others? Yes. Worth the investment? Absolutely. Highly recommend this product. So. 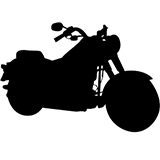 You have a 20,000 Motorcycle and an 800.00 phone. Naturally you want to mount that phone with a $10 Plastic mount? Right? OH NO. Not me. But looking on Amazon at reviews, evidently thousands of people are doing that. Again, Not me. This thing is actually inexpensive for what it is. It's strong, well built, and mounts solidly. The only plastic parts are the adapters for different size handlebars and those SHOULD be plastic. I have an IPhone 8 with a Triamium battery case from Amazon on mine and it fits fine. The product claims to fit up to a 3.25 inch wide phone. I think that's more like 3.5. It should fit anything up to that width. So a really heavy duty case should be no problem. If I had any advice for the manufacturer it would be to slightly increase the diameter of the rods and springs that hold the phone so it applies slightly more pressure but that's a personal preference. I'd pay even more for one that was built this way. I recommend this and would buy it again. Why would you pay $10 bucks to mount an 800 dollar phone? Buy this instead and rest easy. 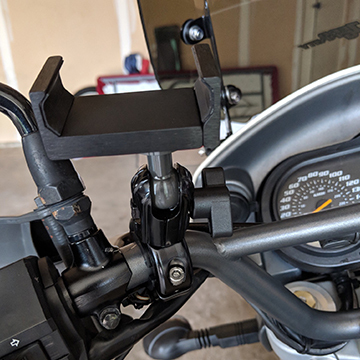 I've been through a number of cheaper mounts, with more than 50% plastic components, which seem to last about half a season. I found this mount and it looked to be mostly made of metal, so it seemed promising. I was right. So far it seems to be worth the additional cost! Solid construction, easy install. The ball head makes getting my phone right where I want it super easy. I work in manufacturing and I had our QC lead take a look at it. He couldn't believe it didn't cost more. 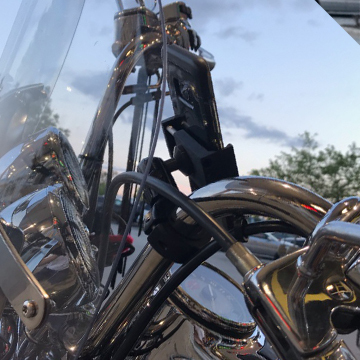 High quality anodizing, good coating on the ball head, well sprung to hold the phone solidly while riding without being difficult to get the phone in and out. 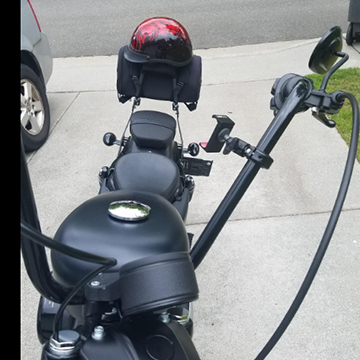 I'm going on a 5 day trip next month and will update my feedback after putting a 1500 miles in with it. Excellent quality, easy to install. Heres'a few pictures from our community.